I realize that you've been dormant for awhile (has it been 13 years already?) and are eager to get out there and enjoy each day. The things is, while I enjoyed the novelty of you for an hour, you've overstayed your welcome. And like Sinbad in the classic 90's film Houseguest, you most certainly, weren't invited. Sure, I'll admit, you're kind of cool to look at, for that second before you're flying into my head. And I'll admit that you're never short on greeting me. In the morning when I wake, you're outside, buzzing so loud it drowns out the birdsong. In the afternoon when I'm outside in what sounds like a bad sci-fi soundtrack, you're so loud that I can look forward to feeling partially deaf the rest of the day. Then in the evening... Well, I didn't want to sleep anyway. But much as I'd like to see you leave (or dead... preferably dead) this letter isn't really about that. There's a question that's been burning in my mind for awhile now: What the heck is the point of you? Seriously, as best as I can tell you don't do anything. At least when the locusts make their appearance every so often, they're there to eat and move on. But all you seem to do is hang out and make that noise. Now, I've been informed that your buzzing is a way to attract mates, but that doesn't help. If all you do is show up every so often to get some action, than I have to inform you that colleges are already filled with people fulfilling that same purpose. There's one other thing, I hear that the primary killer of your species is a type of wasp. You know how I feel about wasps. I've long referred to them as Satan's lances. Now I have to encourage them and become allies with them during operation Quiet Sting. Do you know what that's like? It's like befriending a terrorist organisation to help topple an enemy regime. Do I look like the the US government? In closing, I hate you, you're annoying, please die. I don't blame you for hating them. They are quite ugly. I always think all ugly insects should die. Nice job squeezing Sinbad in there. Love it. We are currently writing a letter back to you. May we borrow some of your phrases? So tell us how you really feel! And I've never seen a live one - just the empty shells in the fall. Yeah, those things are hella loud. Let's hope the wasps do their job! And I don't mean the white, anglo-saxton Protestants. Great post - - - and funny. I believe their main function is to reproduce. Have you come upon a tree with a "swarn" of them on it yet? It is a sight and a half. BTW - - - I do think they're ugly. They look like a creature straight out of Star Wars. Ha ha ha...you crack me up! 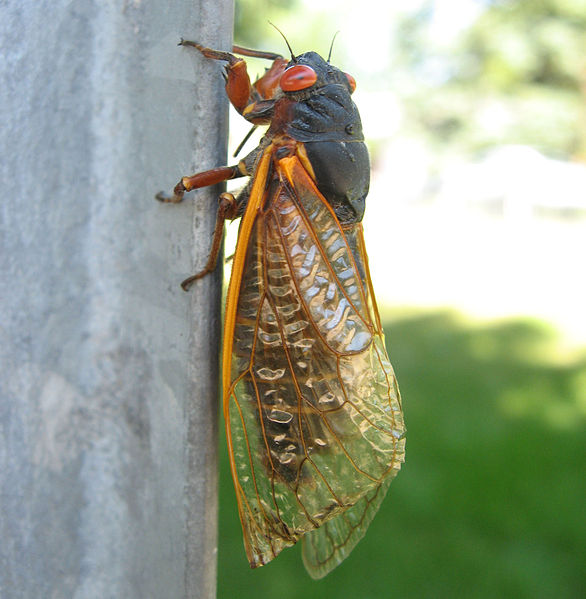 I may be the only person in the world who actually LOVES the sound a cicada (or a hundred of them) make. They are pretty ugly, though, I must admit. omg, i have always hated these things. I think you were kind of harsh. He really just wants some frosted flakes and orange juice. That is their favorite breakfast. Just invite him in next time. I hear they are great at scrabble.